A significant lack of contraceptive information resources in the Aboriginal community in the Hunter region led to a four-year project. Hey Sister! Hey Brother! is a new information booklet tailored to address contraception awareness of Aboriginal women and men in the Hunter region. Approved by local Aboriginal Elders and advisory groups, the booklet uses simple English and sketches to explain a wide range of contraception options, including emergency contraception, condoms, vaginal rings, hormone pills, sterilisation and natural family planning. 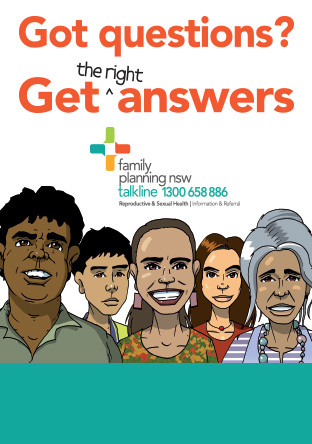 "Every Aboriginal community should have a resource like this," said Ann Brassil, Family Planning NSW CEO. "Today there are so many different kinds of contraception options and finding the right one is essential, which means awareness of all the options is fundamental." In 2004, Family Planning NSW and Birra-li Aboriginal Birthing Services, John Hunter Hospital, started a project to develop Aboriginal contraception factsheets. Finding that only one other out-of-print resource about contraception was available, the partnership decided to take the project to a new level and make a comprehensive booklet. "It's the only one of its kind in the Hunter region," said Susan Guest, project coordinator and health promotion officer for Family Planning NSW. "This meant it had to be perfect: terminology, text size, artwork, colours, everything." To make the booklet visually effective, Vicki Thom, well-known Aboriginal artist and Aboriginal community liaison officer at Hawkesbury District Health Service, created the Aboriginal artwork on the front cover. She will also attend the Hey Sister! Hey Brother! Launch on March 6 at 11:00 am at the Youloe-ta Centre in Hunter as the special guest speaker. "It represents taking control of your life, your health, your future and yourself," said Thom of the artwork. "The hand is what controls our life, our future....the snake represents life, movement and future direction which we are faced with every day." To place an order visit our online Shop or call (02) 8752 4307. For other Aboriginal community friendly services, please contact the state health promotion team.